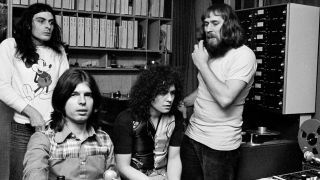 “The Slider was the first T.Rex album conceived as an album and we had a great time making it. We went to the Honky Chateau [Elton John named a 1972 album in honour of Château d’Hérouville, an 18th century country house studio near Paris] to make it, and it was just a magical time. We were sequestered in the studio for about four days and recorded 17 songs. The last day was almost a flurry because we recorded so fast and furiously, but that was the way we worked best. Traditionally, we didn’t labour a song, we’d record one song in one day, and the band often learned the song just before they recorded it. Half the album was pre-rehearsed, but the other half had to be learned in the studio. I remember we did seven takes of one song and Marc said ‘That’s it’. And [T.Rex drummer] Bill Legend said, ‘No, It’s not it! I’ve only just learned the bloody song. Now I can really play it.’ And Marc said, ‘No, that’s it.’ The drumming was great, already more than acceptable, Marc would never go any further than seven takes at the most. “For obvious reasons… David did not record Blackstar as his farewell album, he had another album to do right afterwards. He told me in late December that he had written five new songs, so while in hindsight Blackstar looks like a farewell album, especially if you see the videos, it wasn’t. The reason why I consider Blackstar to be one of my top six albums is because instead of just doing another album like The Next Day we tried something new. Traditionally, David and I always broke the mould for every album we did, we never copied the past. We might make a few references to it, but with Blackstar we wanted to do everything different. The main difference was that we didn’t use his band that he had been using for the past ten years, we used a new band that David discovered in a nightclub, a quartet headed by the saxophone player Donny McCaslin. ““Heroes” was, like Blackstar, brand new. We had already done some innovative things on Low, when we started working with Brian Eno. We went to some strange territories there, especially where we had this new concept of the A-side being recordings with a rock band and the B-side would be ambient recordings with Brian Eno; really floaty, new age stuff, but I would say we really perfected the format on “Heroes”. That was the best we got at doing this, and the songs on “Heroes” were a lot better, at least the ones we recorded with the band. I loved Joe The Lion, such an amazing lads song, and cutting Blackout, which is insane, and has the most amazing drum fills ever recorded. Dennis Davis was a jazz musician who worked out perfectly for David - like Mike Garson - who plays straight-up rock but would then surprise you by throwing in a reference to jazz. So Dennis Davis was, appropriately enough, my hero for that album. The song “Heroes” has been lauded as an anthem since the day it came out. I mean, any heroic event nowadays, whether it surrounds a terrorist attack – which happens too frequently now – there it is. You hear the song “Heroes” all the time. Inadvertently, David wrote this great anthem, and “Heroes” will be around forever, the same as Space Oddity, those two songs will probably have the greatest longevity of all his songs. “The one and only Morrissey album that I produced. The title alone is fantastic, and I assume that Morrissey is the ringleader who is tormenting us. That album, like “Heroes”, was done in a very special place. It was recorded in Rome, and like David, Morrissey brought Rome into the studio. The songs were written about Rome, all of us were doing things in Rome, we’d go out to have dinner together at Italian restaurants, I don’t drink, so I wouldn’t join Morrissey and the band when they would go to nightclubs, but everyone was completely immersing themselves in the city. The atmosphere in the studio while making the album was such that what ever you were doing you were constantly reminded that you were in Rome, and a lot of references to Rome got into the lyrics. We even got the great Ennio Morricone to do the strings on Dear God, Please Help Me which was just fantastic. So that was quite an amazing album and I’m also proud that I made it sound retro, which was on purpose, I think Morrissey wanted it to sound like a Tony Visconti production rather than a modern production where everything is loud and in your face, so I recorded that album with sensitivity in mind. “The first Gentle Giant album. Wherever I go I’m always surprised when someone will recognise me in the street, approach me and say ‘I love Gentle Giant’. This completes it, because no one loved Gentle Giant back in the day except the people who made that record. Even the label was quite disappointed because it was art-rock. But I felt I needed to do that, I needed to work with musicians of that calibre because I studied classical music, I trained hard, and this was very, very challenging. We were working with analogue tape and they were doing things that, honestly, you would have required Protools to pull off. And Protools hadn’t been invented. So we did some tricks that were akin to what George Martin and The Beatles were doing with analogue tape, and made a fantastic work of art. I’m very pleased the group stayed together, the album was promoted and eventually did sell, because the initial sales were very disappointing, maybe only a few hundred. Even the artwork was brilliant. I got my friend George Underwood, David Bowie’s friend from Bromley days, to do the artwork. This was, on every level one of the best albums I was ever involved with. Even as recently as this year, Holy Holy and I were doing gigs all over the United States and at least three fans came up afterwards and said how much they loved Gentle Giant. I’m so glad I can talk about it, because if no one heard this album, it wouldn’t be worth discussing. I love that album, and album two, Acquiring The Taste, which was in many ways better than the first one, but Gentle Giant, the first one, was my favourite because we broke so much fresh ground on that one. It was so innovative. “The Strawbs had started out as a little folk trio, they had an acoustic bass player in the band, and look what happened to them. They became quite an art-rock band themselves. They had two amazing keyboard players in Rick Wakeman and Blue Weaver, but I think Dragonfly was the beginning of them becoming a very, very serious band of progressive musicians. It’s not that usual for a band to come from folk roots - they’re just one of a very few, Steeleye Span, Pentangle, Fairport Convention, to have their beginnings in the folk scene - and then go on to become a big concert rock band. Tony Visconti is the chief judge on the second series of Guitar Star which begins its run on Sky Arts on June 14th at 8pm.